This nutrition consultation consists of dietary recommendations that are individually customized not only for dogs of all life stages and special needs, but also for the life circumstances of the human(s) in the household. A thorough assessment of your dog’s nutritional needs – you complete detailed questionnaires and we discuss additional concerns before I formulate. 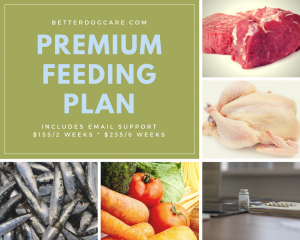 A plan for a fully home prepared fresh-food diet, designed from the ground up and individually balanced for your dog, based on the newest nutritional guidelines of the National Research Council. Choice of cooked, raw, or combination. If you are undecided, I will help you to make the best decision. A shopping list and preparation instructions, so it’s easy to get started. Email support: whether you are already experienced in preparing homemade food for your dog or not, there will always be questions. 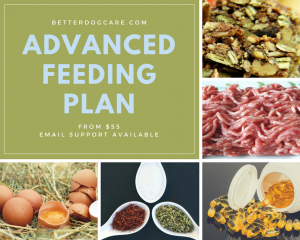 I provide ongoing guidance and troubleshooting, and if needed the support period also allows for making adjustments to the initial feeding plan, at no extra cost. What are my options and how much does it cost? Recommended for dogs without special needs, or start with this option and add on more support time as needed. Recommended for dogs with food allergies or sensitivities, chronic illnesses, or other special needs, or for people who are not skilled in the kitchen and have little to no experience preparing food. Add more support time as needed. This nutrition consultation option consists of dietary recommendations that are individually customized for dogs of all life stages and many special needs. A thorough assessment of your dog’s nutritional needs – you complete detailed questionnaires and we discuss additional concerns before I write out the feeding plan. Suggestions for items from 2 product groups of commercial “complete and balanced” diets. Added fresh food options to improve overall nutritional value. Suggestions for advanced nutritional supplements, as needed. Email support can be added. For dogs without special needs and experienced owners, booking this consultation without email follow-up is usually fine. For dogs with special needs, people who would like to go beyond just the initial steps of improving their dog’s diet, or owners who are not confident about making changes on their own, I recommend this option so I can help you settle into the new routine comfortably and we can ‘troubleshoot’ any issues and work out all the wrinkles. Add additional product groups at $15.00 each, up to 3 additional (5 total). 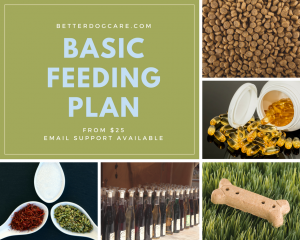 A thorough assessment of your dog’s nutritional needs – you complete a detailed questionnaire and we discuss additional concerns before I write out the feeding plan. Diet Suggestions based on commercial dry dog foods (kibble). Suggestions for basic nutritional supplements. For dogs with special needs, people who would like to go beyond just the very basic steps of improving their dog’s diet, or owners who are not confident about making changes on their own, I recommend this option so I can help you settle into the new routine comfortably and we can ‘troubleshoot’ any issues and work out all the wrinkles. This option also offers the greatest discount for one-on-one guidance.